Let’s face it. Everyone’s lives feel busier and busier these days. With that being said, it can be difficult to keep up with chores and tasks that need to be done around the house. However, failing to take care of small things could lead to very big problems down the road. That’s why all home owners should consider using the home maintenance checklist template from Microsoft. With the home maintenance checklist, all of your maintenance tasks are laid out in a clean, easy-to-read and use format. The checklist also allows you to get things done in a timely manner. You can download and print the home maintenance checklist template instantly for free! Simply click the download link located on this page! 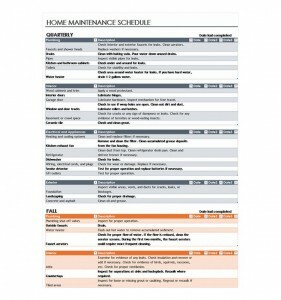 The home maintenance checklist is an Excel spreadsheet created by Microsoft. After downloading, save the home maintenance checklist somewhere on your computer where it will be easy to find. That way, you won’t be scrambling to find the template when you need it the most. The tasks for “Plumbing” include: cleaning the faucets and shower heads, drains, pipes, kitchen and bathroom cabinets, toilets and the water heater. There is a brief description next to each task, as well as a space to note when the last time the task was completed. The entire home maintenance checklist is formatted this way and should be filled out accordingly. Keep your home looking beautiful and help avoid major potential problems with the home maintenance checklist template from Microsoft. Download the home maintenance checklist template for free today!